Posted 21/03/2014 05/10/2016 Mollie Hughes. Before climbing Mount Everest what other mountains had you climbed? The first mountain I ever climbed was Mount Kenya on a school trip when I was 17, from that moment of standing on top of that beautiful mountain I was hooked. Throughout the rest of school and university I would save up as much money as I could in the year and then spend it all on an expedition over the summer. I climbed in the Indian Himalayas, Volcanos of Ecuador, North and East Africa. Then after I decided I wanted to climb Everest I spent some time in the French Alps and had an expedition on Ama Dablam in Nov 2011. What single piece of training advice would you give to a prospective Everest climber? To train hard, it’s tough up there! But also not to lose focus, nobody really likes getting up in the morning to train when it’s cold or wet outside….maintaining motivation by focusing on the end result is important and trust me it’s so, so worth it! Was there any piece of kit or item that you didn’t have on Everest that you wish you had and why? I don’t think there was anything I was in need of….essentials that I really appreciated were my Ipod and my Kindle, when you plug in to your Ipod and read a good book it makes it easy to forget you’re freezing in a tent halfway up Everest…. What is the scariest part to climb both going up and coming down on Everest? The Icefall, it’s a weird place. The thought that you could be killed at any moment always plays on your mind, if an ice tower were to collapse or a serac to fall onto the route; there are not many places to escape. With the instability of the west shoulder this year there was a section that took about 25 minutes to get through near the top of the icefall, covered in avalanche debris and the route often destroyed, we just had to power through and get out as quickly as possible. The icefall is scary don’t get me wrong, but it is also really beautiful, and a real honour when it allows you to safely negotiate your way through its unstable ice maze. Did you take any girly things with you and what did you miss the most being away from home? Errrm hair mouse, hair serum, conditioner, make up, moisturiser, mirror, jeans…haha …only for basecamp or below use though 😛 That stuff doesn’t matter when you step on the mountain, but it is nice to feel slightly normal on rest days at basecamp! The only thing I missed were people really, friends and family…mainly because I knew they would be worrying about me back home. How did you feel waiting for 45 minutes to descend the Hillary Step because of others climbing up? I was actually waiting for almost two hours to descend the Hilary Step! We summited relatively early compared to all the crowds so getting up was fine, but on the way down we were stopped on the step by 100s of people coming up in the opposite direction. It’s not an easy place to pass people either, unclipping from the safety line with a 2,000m drop behind you is seriously not cool. It was worrying definitely, it was just me and Lhakpa at this point and when you’re on oxygen it’s a time game, the longer we stayed there the less time was on our side. After two hours of barely making any progress I started to feel awful and realised my oxygen had run out. Lhakpa took complete control and stopped climbers from coming up so we could get of the step and change my oxygen. I was pretty helpless at this point and he was amazing. 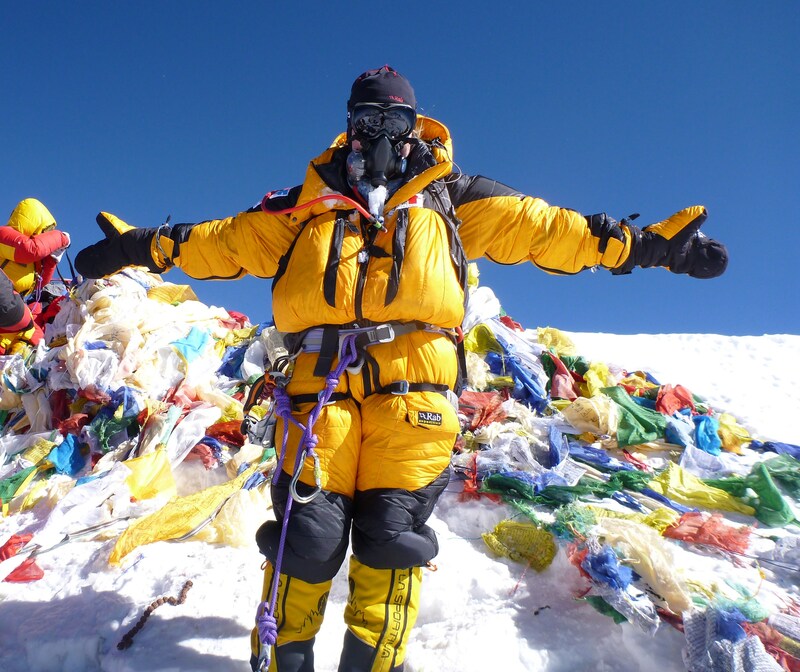 Did you have absolute faith and trust in Sherpa Lhakpa on summit day? Lhakpa is my hero, I couldn’t possibly have more faith and trust in him. We were together on Ama Dablam as well, we had a pretty horrendous expedition, but I saw just how incredible he and the rest of our Sherpa team were, so much respect for those boys. During your climb was there any moment that you were scared for your life? Ha…. constantly!? The icefall, rockfall on the Lhotse face, summit day, all produce tons of fear but you just have to control it in order to succeed on the climb. The only time I seriously thought it was game over was in the Western Cwm, when an avalanche came off Nuptse and was heading straight for us, causing me and Becky to drop our rucksacks and run for our lives. Luckily it wasn’t as big as we first thought and didn’t reach us but it definitely got the heart pumping- sprinting at 6,500m! Was the climb and summit everything you thought it would be? So, so much harder. I thought I knew a lot about the Psychology of climbing Everest after I wrote my University dissertation on it…but I was pushed close to the limit, it took so much metal perseverance to get up there and even more to get back down again. But it was also so much more enchanting than I expected… seeing the millions of stars at night from basecamp, watching the sun set from half way up the Lhotse face or witnessing the shadow that Everest throws onto the stratosphere when the sun rises behind it on summit day, totally magical. I quite like the mystery that we will never really know.